Haven't worked on much in the last several months at all. 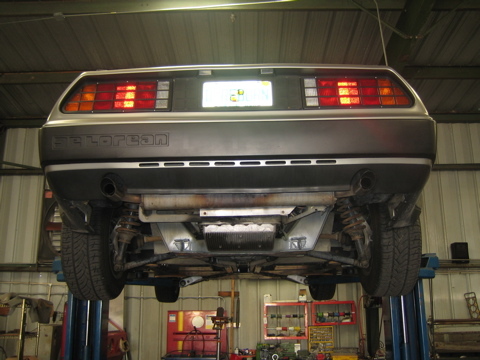 The previous time I dug deep in to something on the car was back in September when the coolant system got an overhaul. 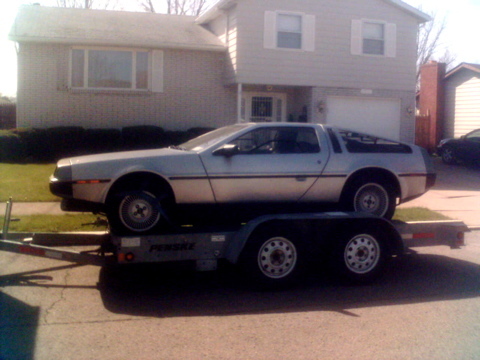 The DeLorean has mostly sat in the garage awaiting the start of small jobs. And then it waited a bit longer. Well the annual Celebration Exotic show is coming up, and I wanted to get a few things tackled before then. First off was the valve covers. I wanted to paint them, redo the seals which were leaking a bit and poorly done, and adjust the valves. 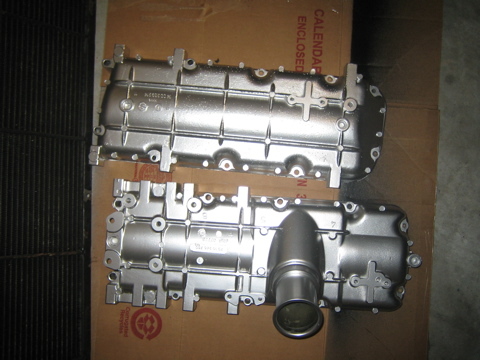 That job has been completed, and below is a pic of the valve covers while being painted. Fully installed pictures will come later. Second, I wanted to redo the outer door seals that have been in a box for the last year and a half. In doing that I also wanted to paint the window trim which was rubbed off in spots. The window trim is back on but the seals are still being installed. A picture of the window trim painting is also below. That may be the extent prior to the show, but on the list to do still is painting the engine bay, touching up the front frame rust, and fixing the A/C system. The A/C has a small leak at the compressor clutch, so the compressor and accumulator will be replaced, along with the low pressure switch, and the system will be flushed/refilled. 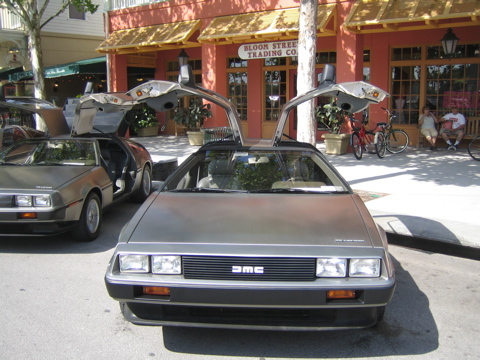 The DeLorean Club of Florida (http://www.deloreanclubfl.com) had a tech day this weekend with a lift. Was able to get the car put up to investigate with a much better perspective than crawling around on my back like usual. Here are some pics. 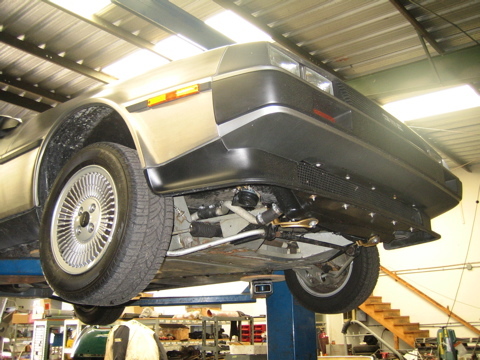 I have been very busy lately and had little time to work on the car. 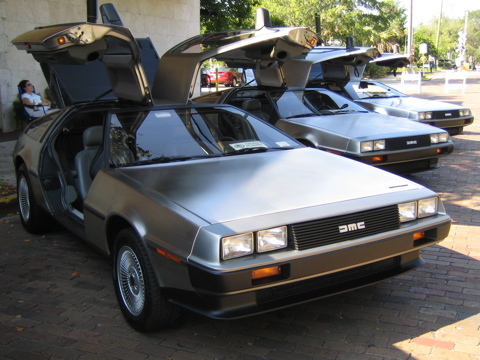 Since the last update the DeLorean Club of Florida had their annual gathering at the Celebration Exotic Car Show. It turned out to be a big success with 18 cars in attendance, our highest record to date. (1) Fix A/C Leak - I have all the tools: vaccuum pump, manifold gauges, R12, freon sniffer, and I put the leak dye in the system. Need to let it sit for a few weeks and then check the car for leaks. Want to replace the compressor & accumulator regardless of where the leak is found. (2) Replace Radiator & Install Low Power Fans - Already bought Toby's low power fans, still need to buy a brass radiator and while the system is drained replace the cooling hoses under the car as the rest of the engine bay was done during the Valley of Death rebuild. (3) Regrain The Car - I have started playing with sanding down the stainless to give it a good grain. The previous owner seemed to just hit spots with sandpaper when he couldn't get something off, so there are marks all over the car that are not in the parallel brushed style. Looks bad. Already started on the passenger door, 60 grit paper, and I am going to step up to 80 grit and probably top it off with a blending pad/stainless steel cleaner. (4) Remove Valve Covers, Paint, Replace Seals - Already have the seals and the paint, just need the time. 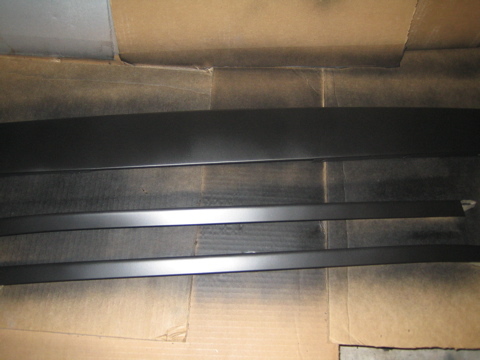 (5) Paint Engine Bay - Have the SEM Trim Black paint, also just need the time. (7) Replace Outer Door Seals - Have these on hand too, waiting until the regraining is done so I don't scuff them up. 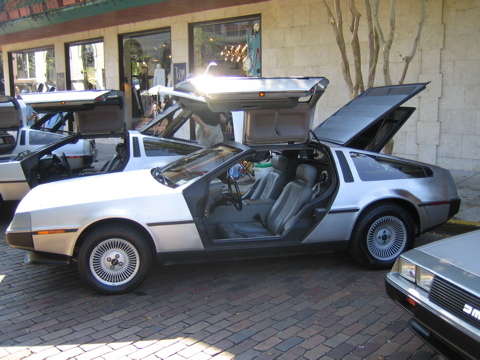 Had a tech day with the DeLorean Club of Florida (www.deloreanclubfl.com) and got some things accomplished with the car. (1) Finally got the horns fixed, wired up a horn relay. Will be posting more info on the whole procedure soon. 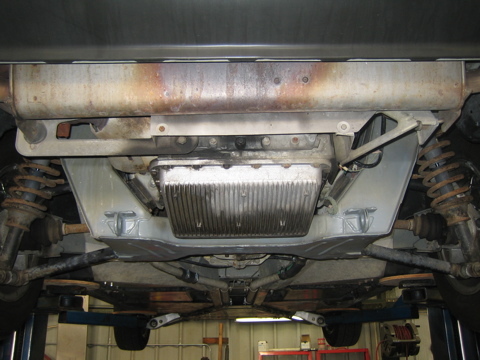 (2) Sanded and spraypainted the metal bracket against the back wall of the engine bay as it was all rusted. (3) Replaced my glove box light so now it works. (4) Fixed steering wheel turn signal issue. (5) Added new hood stops and replaced some plastic caps on the wiper arms. Not a ton, just hanging out and mostly having fun. Three things I am glad are off my list now. (1) Frame rust fix - going to start this tomorrow, sand down and POR15 a few rust spots on the frame and then spraypaint over the POR15 to match the frame. (2) Steering wheel adjustment - after replacing the horn switch I misaligned the ring that disables the turn signal after a turn. Need to pop off the wheel and adjust. 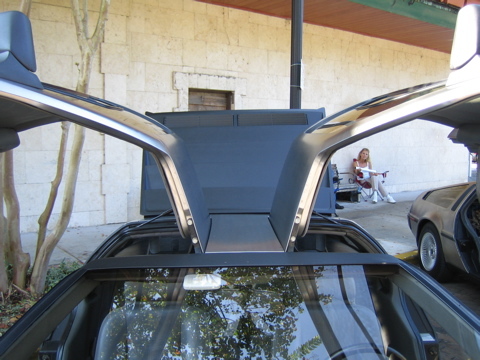 April 29th 2006 was this years Celebration Exotic Car Show in Celebration, FL. As I have only been in Florida for several days now, I was very much looking forward to meeting the local owners and participating in my first big auto show. I met up with several owners the previous night at Brandon's house. We worked on prepping the cars for the show, and I had to give my car a bath to clean off all the dirt attached to it from being towed 1,300 miles. After a nice few hours of conversation the mosquitos came out which pretty much broke up the gathering. We arrived back at Brandon's at 8:30am the next morning to do a caravan to the show. This is my second time in a D caravan, but the first time I was not an owner, just a follower. It was very fun, we took some winding back roads into Disney. Enjoyable and very interesting. The show turned out to be a success. 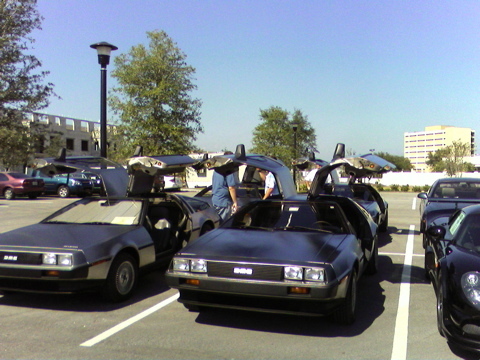 There were about 12-14 DeLoreans present at any point during the day. 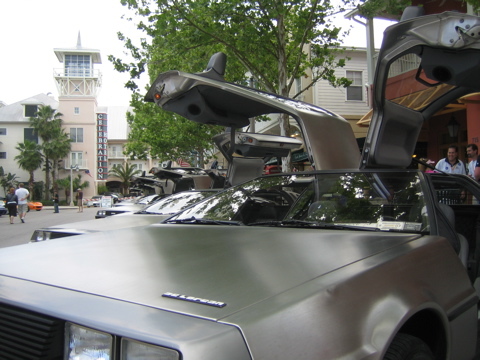 Many people seemed to enjoy seeing the cars all gathered together. 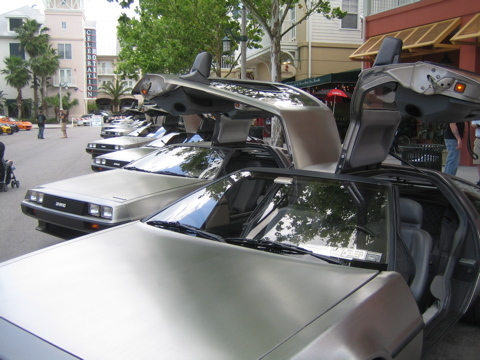 Of course I did get a few drug comments, and a few flux capacitor jokes, but nothing too bad. The first picture below is the front of my car, if you look close you can see the freshly painted grill and bumper compared to the discoloration of the lower front spoiler which will be worked on soon. The second picture here is of the 'judges' looking over the engine bay and picking at which parts I didn't buy from them! :) We have Stephen Wynne, Rob Grady, and Tony from DMC Florida. 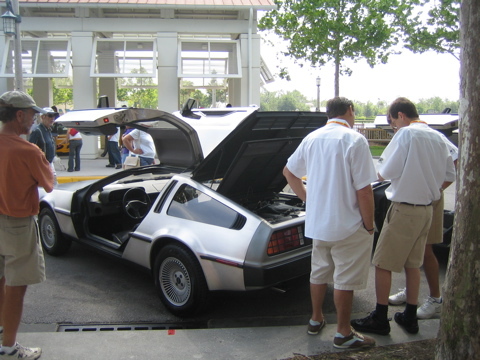 The remaining pictures are of the line of DeLoreans at the show. If you are familiar with Celebration, we were around the lake in the downtown corridor next to the Celebration Hotel. Made the move yesterday from good old Niagara Falls, NY where I grew up, down to Orlando, FL where they never ever see snow. 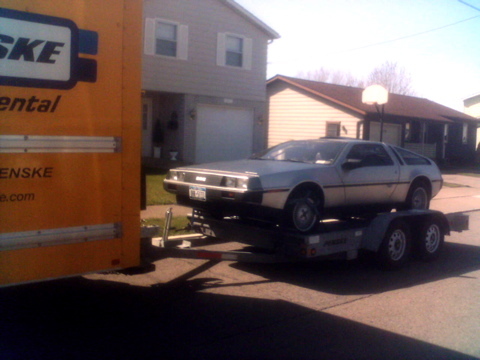 The DeLorean is in for a treat, as I can drive it all year 'round now. The drive down with the moving truck towing the car was a bit hectic, but we made it down here in one piece. No damage or any problem with the car, besides a lot of dirt. It's actually driving good so far, seems to be idling a bit lower than usual. Check below for some pictures of the car before the journey.